For Todd Storz, it all began in 1949 at a little 500-watt daytimer in Omaha, Neb. He and his brewing-baron dad bought KOWH radio from the Omaha World-Herald, which apparently had run the struggling station as something of an afterthought to printing the day's news on dead trees. 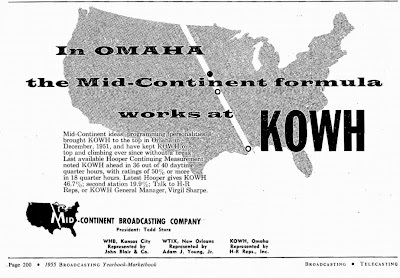 TWO YEARS later, in December 1951, KOWH was the biggest thing in the Big O. In 1955, Storz' second purchase, WHB in Kansas City, was well on the way to similar success. 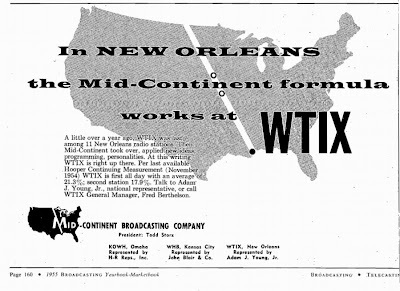 As was WTIX in New Orleans, the third station in the Mid-Continent Broadcasting Co., chain. 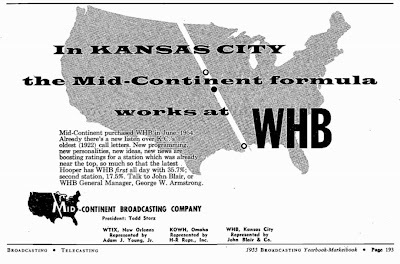 THESE ADS for the Storz chain, found in the 1955 Broadcasting Yearbook and the April 13, 1953 edition of Broadcasting, attribute the stations' speedy rise to "the Mid-Continent formula." Roughly speaking, that formula grew from a skeleton of "spaced repetition" of hit records, hourly newscasts and non-stop fun promotions. What the trade ads called "the Mid-Continent formula" soon enough swept the radio world and saved a dying industry, one nearly obliterated by the rapid rise of television. What we came to know it as was much simpler -- Top 40. Todd Storz died in 1964, of an apparent stroke at just 39. But his radio kingdom survived him and went on for years after. And his creation lives on in the rock 'n' roll hearts of we who are forever young.